Seek shade. That is what I will almost certainly do if the temperature hits and exceeds 25°C. I am not a natural sunbather. Read some of the posts about my travels to the far north and you will see that freezing temperatures hold no fear for me. Stinking hot sunshine on the other hand - scary. Sweating, sunburn and sunstroke are not my cup of tea. However on this occasion I had to get out into the sunshine, there was no shade where I was headed. I slapped on a hat after slopping on some pore-clogging factor 30 and feeling uncomfortably greasy I stepped out into the sun. I hadn’t gone south, not out of the country, I was still on the Patch, Thurstaston Shore to be precise - one of my usual haunts. 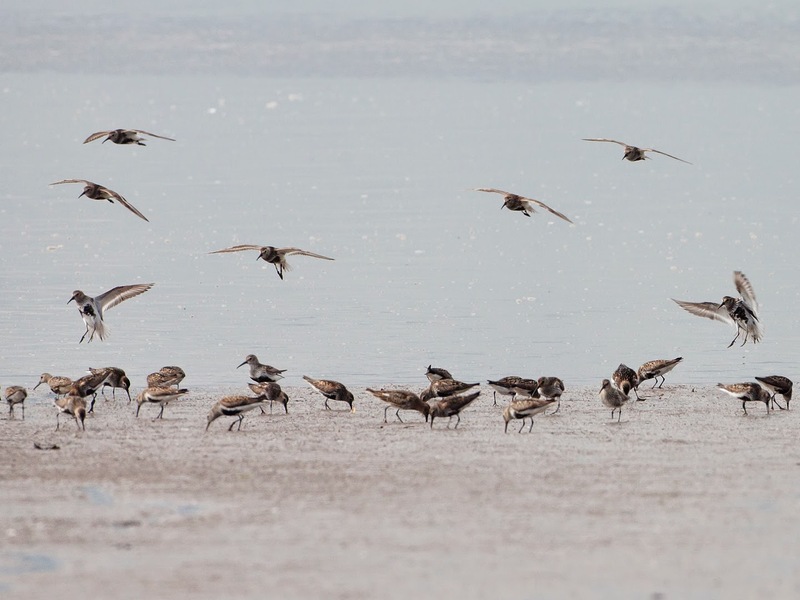 Thousands of waders have returned to the muddy banks of the Dee and I was keen to hook up with them again since the majority of them left at the end of April. I sloped down the cliffs with camera bag and tripod mounted telescope weighing me down, the effort making me sweat off some of the sun cream and leaving me feeling slightly more uncomfortable. Sand flicked off my shoe and stuck to the cream protecting my legs. Beads of sweat and residue of sun cream coagulated on the binocular strap around my neck. Yuk. The tide was starting to flood and after a cursory glance at the shore from the cliff top on Saturday I figured I would be treated to a good show of Redshank if I came back on a rising tide on my day off. As predicted the Redshank are here in abundance but I wasn’t expecting the 2,000 Dunlin that greeted me as I hit the shore. Instantly I forgot all my petty complaints about summer birding and I was plunged back into the world of wading birds on my beloved Patch. I live and work on the Patch and over the years I have got to know it inside out. I have even started to name bits of it with peculiar nicknames after memorable or funny events. Lots of patch watchers do this and all kinds of nicknames arise with meaning only to the patcher. I love this. So today I’m walking up towards Heswall parallel with part of the Patch I call Mono Valley. Mono Valley is not a valley. It is a channel a few feet deep that the tide has carved in to the mudflats and it runs from Tinkers Dell at Thurstaston to Heswall Fields on the fringes of the marsh. 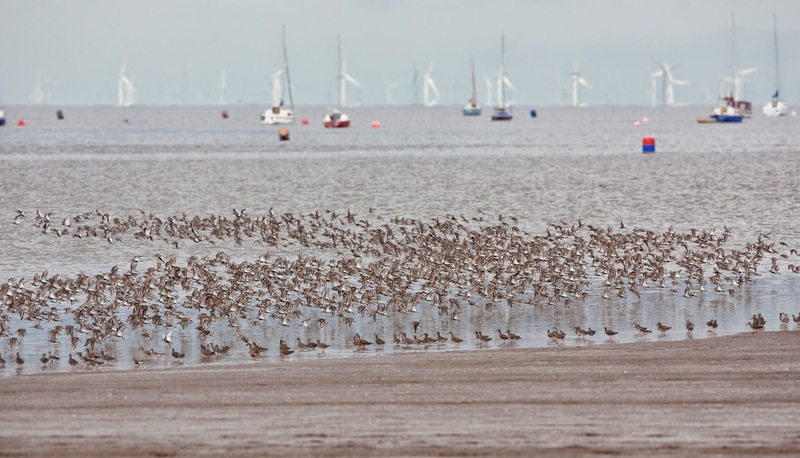 Birds feed in and around it, a really small tidal bore can be seen long before the main front of the tide reaches the flats. It fills up rapidly and the birds spill out from roost sites on the channel/valley wall. At low water birds line the valley walls, presumably feeling safer in the valley rather than on the exposed mudflats. Mono Valley has no audio properties either mono or stereo. A long time ago I saw some birds flying along the channel. At this point I was just calling it the valley but seeing the birds flying down it I recalled an album from early 90’s Liverpool indie bad The Popinjays called Flying Down To Mono Valley and ever since that day…. The Dunlin and Redshank are being pushed around by the tide and some start to fly down Mono Valley towards their roost sites in the marsh. I studied them through the scope to see if there are any more unusual small waders mixed in. 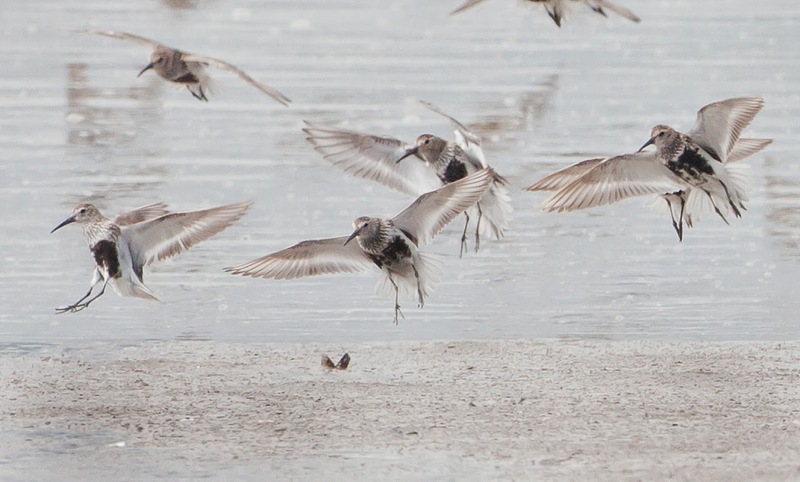 I found a Sanderling in summer plumage (rare on Thurstaston Shore) and a few Ringed Plovers. A particularly large and peachy coloured bird could have been a Curlew Sandpiper but I couldn’t be 100%, it is a little early for them. I will have to come back. Wandering on I reached the elbow. This is a bend in Mono Valley close to my final destination and is a good spot for Greenshank (there are none today) and pretty soon Teal will be back loafing on the mudbanks here. Lots of the Dunlin are moulting, they still had some smart golden plumage on their wings but their striking summer black belly patches are fading to a belly smudge. I counted the Dunlin (2,000) and the Redshank (4,500) while Whimbrel called from the marsh. I found a single Knot in fading summer plumage. 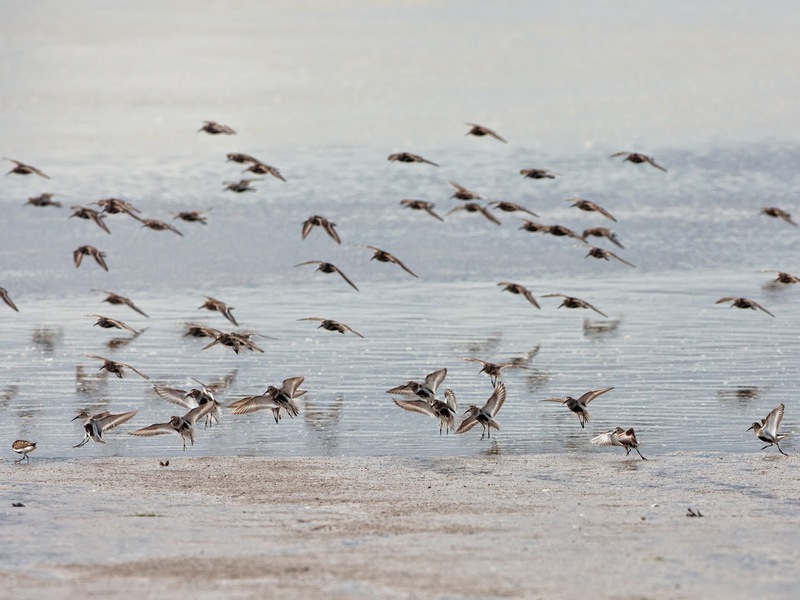 20 Blackwits spring from Mono and fly towards Connah’s Quay. The hot sun was beating down but I don’t recall feeling it, so transfixed weas I by the birds. I started to look in detail at the Dunnies, trying to spot the differences between subspecies. Should I be seeing schinzii and alpina at this time? I racked my fried little brains to remember which one has the longest bill and other distinguishing features. After a while I decided not to get bogged down in taxonomy, plus the birds were a bit too far for frame filling shots so I decided just enjoy the birds. 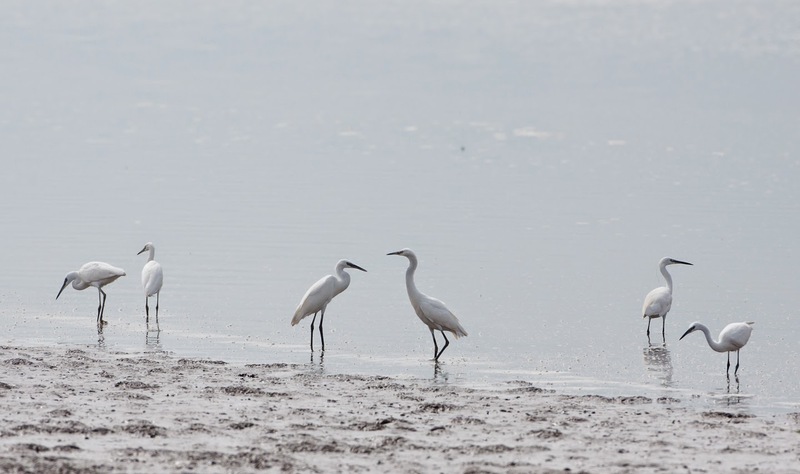 Six photogenic Little Egrets drifted along Mono and alighted on the edge of the tide to feed. I get to Heswall Fields and sit on Scotch. The birds start to populate the creeks and gullies in the marsh, too many valleys to name. 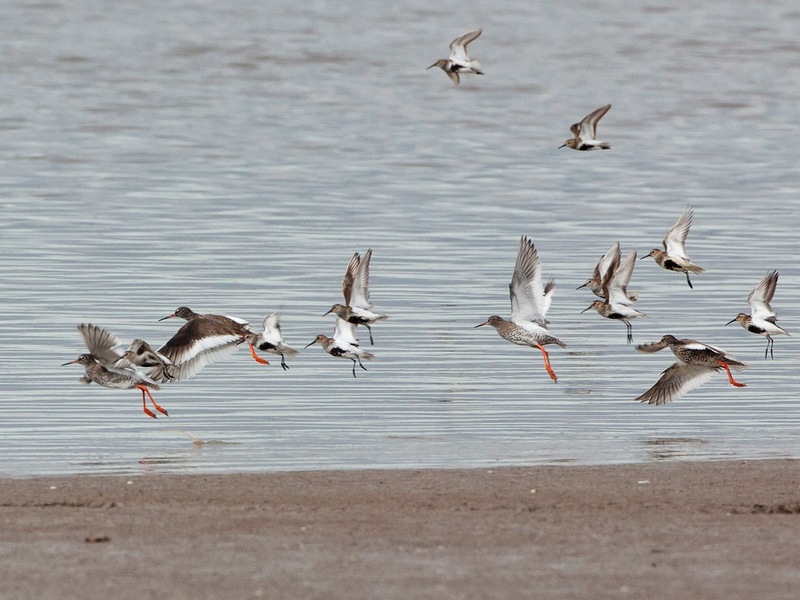 They disappear from view as the mudflats disappear under the tide. The birding action subsides and sitting in the sun on Scotch I start to feel the heat again. I drain my water bottle and seek shade.